Boys Basketball Game CANCELLED for today 12/7/18. Rescheduled for 1/21/18. School appropriate costumes and attire. No masks, hoods, or props. Boys/Girls Soccer Game CANCELLED today 12/6/2018 due to weather. Show your school spirit by dressing up each day during Red Ribbon Week! that support the success of all students. Registration — 8 to 8:30 a.m.
Summit—8:30 a.m. to 2 p.m.
Cross Country Meet "Can you Beat the Athlete" Fund Raiser. $3.00 to participate. You can sign up in the high school office. Event is a 3 mile race. Parents and Summit community welcome. Poll workers needed! Earn money and serve your community! 3. Click on My Poll Worker Application or Complete the application attached to this post. XCountry Meet Event: Beat The Athlete! Summit Community! Join us in cheering on our Cross Country team on October 17th at 4:00pm at the High School campus. Fundraiser "Beat the Athlete", you can sign-up to run against the team and coaches. If you beat them, you will win a Prize! Come join us for breakfast on October 9th, 2018 at 8:00 A.M. 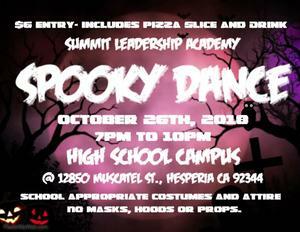 Hosted by Summit Leadership Academy Administration. Get to know the Executive Director and the Principal.